Aim: To evaluate the disinfection of dentinal tubules using calcium hydroxide with propylene glycol and calcium hydroxide with iodoform in silicone oil, as compared to 2% chlorhexidine gel. Results: All three medicaments used in this study exerted antibacterial and antifungal activity. Group II (calcium hydroxide with propylene glycol) and Group IV (2% chlorhexidine gel) had the highest antimicrobial activity and the differences between their antibacterial activities were not statistically significant. Group III (calcium hydroxide with iodoform in silicone oil) and Group IV had the highest antifungal activity and the differences between their antifungal activities were not statistically significant. The inhibition of growth at 200 μm and 400 ΅m was uniform, with no statistical difference. Conclusions: Two percent chlorhexidine gel was effective against both E.faecalis and C.albicans. Calcium hydroxide with propylene glycol was the most effective intracanal medicament along with 2% chlorhexidine against E.faecalis, whereas, calcium hydroxide with iodoform in silicone oil was the most effective intracanal medicament along with 2% chlorhexidine against C.albicans. Calcium hydroxide has been widely used in endodontics. However, E.faecalis and C.albicans have been reported to be resistant to the antimicrobial effect of calcium hydroxide as a result of their ability to penetrate the dentinal tubules and adapt to the changing environment. Therefore, a search for a better alternative has led to various formulations of calcium hydroxide, using different vehicles and newer antimicrobial agents such as chlorhexidine. To date, no study has compared the antimicrobial efficacy of calcium hydroxide with two different vehicles (propylene glycol and iodoform with silicone oil), with chlorhexidine, against E.faecalis and C.albicans. 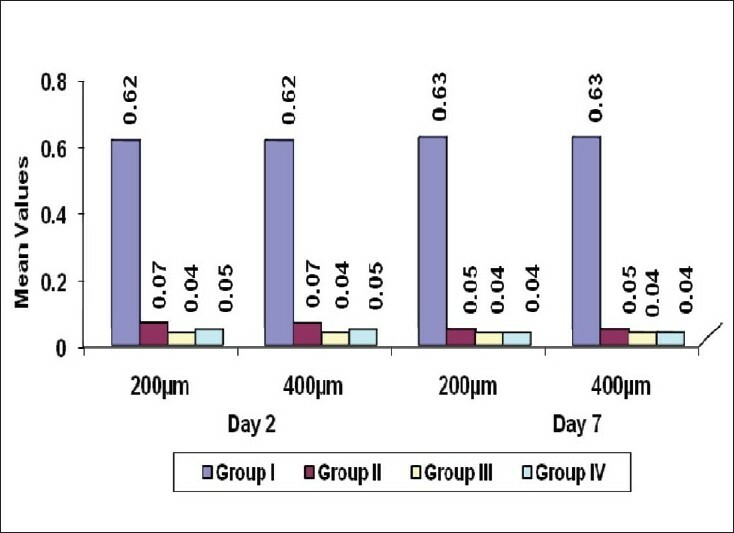 The aim of this study is to determine the antimicrobial efficacy of two different formulations of calcium hydroxide and compare it with that of chlorhexidine, using an in vitro model of E.faecalis and C.albicans dentinal tubule infection. A rotary diamond disk was used to decoronate 80 freshly extracted, single-rooted human teeth, 5 mm below the cementoenamel junction. The remaining root was sectioned such that 6 mm of the middle third of the root was obtained. The cementum was removed from the root surface to standardize the external diameter to approximately 4 mm, using a cylindrical diamond bur (Mani Inc., Japan). The internal diameter was standardized to Gates Glidden drill number 3 (Mani Inc., Japan) with a slow speed handpiece (NSK, Tokyo, Japan). The organic and inorganic debris was removed by treating the blocks with 17% ethylenediaminetetraacetic acid (Dent Wash; Prime Dental Products Pvt. Ltd.; GG-41) for five minutes, followed by 5% sodium hypochlorite (Prime Dental Products Pvt. Ltd.; B.No 188777-0) for five minutes. Next they were dipped in distilled water for five minutes and sterilized in an autoclave at 121°C. Half the number of blocks was subjected to a second cycle of sterilization, with the blocks immersed in 1 ml of tryptone soya (TS) broth in individual microcentrifuge tubes, and the other half in sabourauds dextrose (SD) broth. E.faecalis and C. albicans were used as the test organisms. Twenty-four hour colonies of pure culture of E.faecalis (ATCC 29212) and C. albicans (90028) grown on tryptone soya agar and Sabourauds dextrose agar, respectively, were suspended in 5 ml of TS broth for E.faecalis and Sabourauds infusion broth for C. albicans, and incubated for 24 hours at 37°C. The culture suspensions were adjusted to match the turbidity equivalent of a 0.5 McFarland standard. Fifty microliters of inocula were transferred to presterilized individual microcentrifuge tubes containing 1 ml of respective broths and dentin block. The dentin blocks were transferred to a fresh broth containing microorganisms, every second day. All the procedures were carried out in a biosafety cabinet. The purity of the culture was checked by subculturing 5 μl of the broth from the incubated dentin blocks in the respective broths, on agar plates. The blocks were infected during the 21-day period. After the incubation period, the blocks were irrigated with 5 ml of sterile saline, to remove the incubation broth. The dentin blocks were assigned to the following groups (n = 5) for each day. Forty blocks were used for E.faecalis and 40 for C.albicans. Group I: Normal Saline(0.9%w/v; NS 500 ml,B.No. 301211411) [negative control]. Group III: Calcium Hydroxide (30.3%), Iodoform (40.4%), Silicone oil (22.4%), and inert substances (6.9%), (Vitapex; Neo Dental Chemical Products Co. Ltd., Tokyo, Japan). Group IV: Two percent Chlorhexidine gel (20% CHX digluconate solution; Sigma Aldrich, Bangalore,C9394) [20% solution was first diluted to 2% and then the 2% CHX gel was prepared by mixing it with polyethylene glycol as the vehicle and methyl cellulose as the thickening agent  ]. All the blocks, after medication, were sealed above and below with paraffin wax and incubated in an aerobic environment, at 37° C. An antimicrobial assessment was performed at the end of two and seven days, with five blocks from each group, for every time interval. The blocks were washed with 5 ml of sterile saline combined with ultrasonics to remove the medicament. 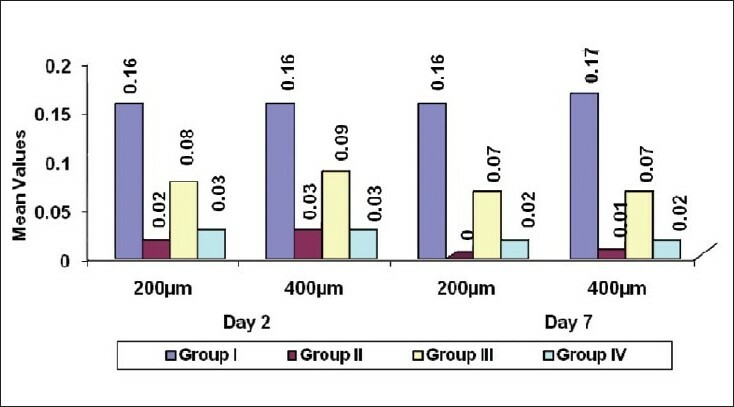 Dentin debris were harvested at depths of 200 μm and 400 μm by using GG drills (Mani Inc., Japan) Nos. 4 and 5 ,respectively, collected in 1 ml of sterile broths, and incubated in aerobic environment at 37°C for 24 hours. After the incubation period, the content of each microcentrifuge tube was evaluated by measuring the optical densities using the Multiskan Spectrum (Thermo Scientific) microplate spectrophotometer, at 620 nm. The data were analyzed with one-way analysis of variance followed by Tukey multiple comparison test, to check the differences in microbial inhibition between the groups (P < 0.05 = *, P < 0.01 = **, P < 0.001 = ***). The paired t test was used to check the differences in growth at different time intervals within the groups and for differences at the two depths at (P < 0.05 = *, P < 0.01 = **, P < 0.001 = ***). All the three medicaments used in this study exerted antimicrobial activity. Group II and Group IV had the highest antimicrobial activity. There was no statistical difference between Group II and Group IV and between 200 μm and 400 μm. For all the three medicaments the bacterial inhibition was significantly more on the seventh day as compared to the second day. The inhibition of growth in all the groups was statistically significant in comparison to Group I [Figure 1]. All the three medicaments used in this study exerted antimicrobial activity. Group III and Group IV had the highest antimicrobial activity. No statistical difference was seen between Group III and Group IV and between 200 μm and 400 μm. For all the three medicaments the fungal inhibition was significantly more on the seventh day as compared to the second day. The inhibition of growth in all the groups was statistically significant in comparison to Group I [Figure 2]. E.faecalis is a normal inhabitant of the oral cavity and is associated with different forms of periradicular disease. C. albicans is the fungal species most commonly detected in the oral cavity. It has been demonstrated that E.faecalis and C.albicans are highly resistant to calcium hydroxide. A combination of two medicaments may produce additive or synergistic effects. Therefore, different vehicles have been added to calcium hydroxide in an attempt to enhance its antimicrobial activity against the two tested microorganisms. The results of this study showed that for C.albicans, Group III (calcium hydroxide with iodoform) and Group IV (2%chlorhexidine gel) had the highest antifungal activity, and the differences between their antifungal activities were not statistically significant. Iodine was bactericidal as well as fungicidal. The antimicrobial action of calcium hydroxide with iodoform against C. albicans might be due to the role of the calcium ions in the regulation of C. albicans morphogenesis. It inhibited the mycelial growth of C.albicans. The antimicrobial effect of calcium hydroxide, due to the release of hydroxyl ions, might be enhanced due to the inhibition of C.albicans growth by calcium ions. This might be the possible cause for the better performance of Group III, for C.albicans. Chlorhexidine has a reasonably wide range of activity against aerobic and anaerobic organisms as well as the Candida species. This might be responsible for its high antimicrobial activity against E.faecalis and C.albicans. The antimicrobial action of all the three medicaments increased on the seventh day as compared to that on the second day, for both the organisms tested in the study. Propylene glycol was hygroscopic in nature, and therefore, there was a sustained release of hydroxyl ions from calcium hydroxide. This might be the reason for the increased antimicrobial activity of Group II on the seventh day. Calcium hydroxide with iodoform in silicone oil had an oily vehicle. As oily vehicles have the lowest solubility and diffusion of the paste within the tissues,  it might have resulted in the better antimicrobial action of Group III on the seventh day. For chlorhexidine, it had the property of substantivity, , which might have been responsible for its higher antimicrobial activity in Group IV on the seventh day as compared to the second day. Results obtained from the in vitro laboratory experimental study cannot be directly extended to the clinical situation; however, they do provide reproducible and reliable means for comparing and testing the antimicrobial efficacy of various intracanal medicaments. Two percent chlorhexidine gel was an effective antibacterial and antifungal intracanal medicament against E.faecalis and C.albicans, respectively. The type of vehicle used would alter the antimicrobial property of calcium hydroxide as an intracanal medicament. Addition of propylene glycol to calcium hydroxide as an intracanal medicament made calcium hydroxide an effective antibacterial agent against E.faecalis. Addition of iodoform with silicone oil to calcium hydroxide as an intracanal medicament made calcium hydroxide an effective antifungal agent against C.albicans. 2. IngleJI, Bakland LK. Endodontics 5 th ed. Hamilton Ontario Canada: Elsevier; 2005. p. 78. 3. Siqueira JF, Rocas IN. Polymerase chain reaction-based analysis of microorganisms associated with failed endodontic treatment. Oral Surg Oral Med Oral Pathol Oral Radiol Endod 2004;97:85-94. 4. Waltimo TM, Siren EK, Torkko HL, Olsen I, Haapasalo MP. Fungi in therapy-resistant apical periodontitis. Int Endod J 1997;30:96-101. 5. Evans M, Davies JK, Sundqvist G, Figdor D. Mechanisms involved in the resistance of Enterococcus faecalis to calcium hydroxide. Int Endod J 2002;35:221-8. 6. Waltimo TM, Siren EK, Orstavik D, Haapasalo MP. Susceptibility of oral Candida species to calcium hydroxide in vitro. Int Endod J 1999;32:94-8. 7. Simon ST, Bhat KS, Roy F. Effect of four vehicles on the pH of calcium hydroxide and the release of calcium ion. Oral Surg Oral Med Oral Pathol Oral Radiol Endod 1995;80:459-64. 8. Fava LR, Saunders WP. Calcium hydroxide pastes: Classification and clinical indications. Int Endod J 1999;32:257-82. 9. Athanassiadis B, Abbott PV, Walsh LJ. The use of calcium hydroxide, antibiotics and biocides as antimicrobial medicaments in endodontics. Aust Dent J 2007;52:s64-82. 10. Haapasalo M, Orstavik D. In vitro Infection and Disinfection of Dentinal Tubules. J Dent Res1987;66:1375-9. 11. Krithikadatta J, Indira R, Dorothykalyani AL. Disinfection of dentinal tubules with 2%Chlorhexidine, 2% Metronidazole, Bioactive Glass when compared with Calcium Hydroxide as Intracanal Medicaments. J Endod 2007;33:1473-6. 12. Siqueira JF. Strategies to Treat Infected Root Canals. J Calif Dent Assoc 2001;29:825-37. 13. Basrani B, Santos JM, Tjäderhane L, Grad H, Gorduysus O, Huang J, et al. Substantive antimicrobial activity in chlorhexidine-treated human root dentin. Oral Surg Oral Med Oral Pathol Oral Radiol Endod 2002;94:240- 5. 14. Neelakantan P, Sanjeev K, Subbarao CV. Duration-dependent susceptibility of endodontic pathogens to calcium hydroxide and chlorhexidine gel used as intracanal medicament: An in vitro evaluation. Oral Surg Oral Med Oral Pathol Oral Radiol Endod 2007;104:e138-41. 15. Sjogren U, Figdor D, Spangberg L, Sundqvist G. The antimicrobial effect of calcium hydroxide as a short-term intracanal dressing. Int Endod J 1991;24:119-25. 16. Lee Y, Han SH, Hong SH, Lee JK, Ji H, Kum KY. Antimicrobial efficacy of a polymeric Chlorhexidine release device using in vitro model of Enterococcus faecalis dentinal tubule infection. J Endod 2008;34:855-8. 17. Levinson W. Review of medical microbiology and immunology 9 th ed. New York:Mc Graw-Hill; 2006. 18. Gillmore MS. The enterococcus pathogenesis, molecular biology and resistance. 1 st ed. Washington DC: ASM Press; 2002. 19. Ananthanarayan R, Paniker CK . Textbook of microbiology. 6 th ed. Chennai:Orient Longman; 2000. 20. Holmes AR, Cannon RD, Shepherd MG. Effect of calcium ion uptake on Candida albicans morphology. FEMS Microbiol Lett 1991;61:187-93.
salem milani, a. and froughreyhani, m. and charchi aghdam, s. and pournaghiazar, f. and asghari jafarabadi, m.
Nainan, M.T. and Nirupama, D.N. and Benjamin, S.
Bolla, N. and Kavuri, S.R. and Tanniru, H.I. and Vemuri, S. and Shenoy, A.
de siqueira zuolo, a. and bodelon, m.b. and rached-junior, f.j.a. and leoni, g.b. and pécora, j.d. and de sousa-neto, m.d.